Ten automakers with 57 percent of the U.S. market share will make automatic braking standard soon, the DOT, NHTSA and IIHS announced Friday. The technology has a huge potential to cut into collision repair rear-end business within a decade of its introduction as a standard feature, given the average age of fleet and repaired vehicles. The Insurance Institute for Highway Safety said the technology can cut injury claims by 35 percent, and other studies have shown drops in crashes in general. There’s not a “due date” for the standardization announced for Audi, BMW, Ford, General Motors, Mazda, Mercedes Benz, Tesla, Toyota, Volkswagen and Volvo. However, many of these already planned to offer it standard or as an option in the 2016 model year. Auto-braking, often known as AEB (automatic emergency braking), will stop the car in anticipation of a crash — often a rear-ending situation — if the driver fails to do so. Prior to that, the systems typically alert the driver and then start preparing the brakes so the errant driver doesn’t have to apply as much pressure when he or she finally stomps on them. The systems typically work at lower speeds, but that’s where the majority of rear-ending occurs anyway, according to Toyota. “The Department and IIHS encourage all other light-vehicle and trucking manufacturers to bring automated vehicle technology to all vehicles on U.S. roadways as soon as possible,” the NHTSA release states. Auto-braking won’t be mandated on the holdouts. However, the NHTSA wants to add the technology to its recommended advanced features. The IIHS often doesn’t give “Top Safety Pick-Plus” ratings to cars without auto-braking as an option. Asked if there were plans to make AEB necessary to achieve the Top Safety Pick rating, the second highest IIHS rank, an IIHS spokesman wrote in an email that advanced headlights would probable come first. 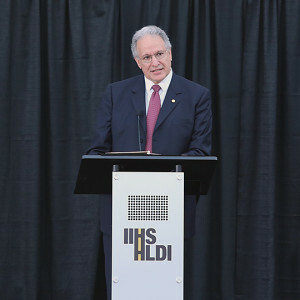 The announcement came at the expanded Vehicle Research Center, which the NHTSA said will let IIHS better test new crash-prevention technology.